We’re pleased to announce our recommendations for the 13 statewide measures appearing on the 2018 general election ballot in Colorado. These recommendations are the result of a vote of the ProgressNow Colorado Board of Directors in consultation with our staff and network of key advisors. 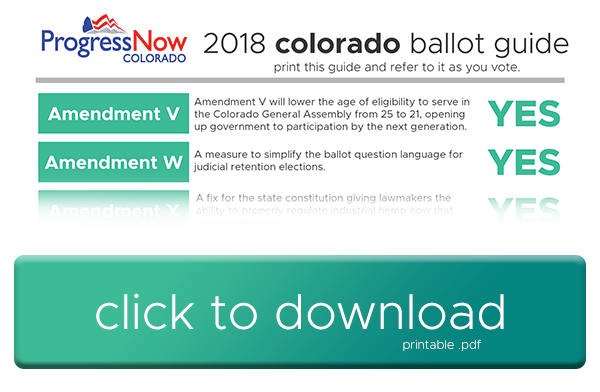 Click here to download your one-page printable Colorado ballot guide. Print this guide to refer to as you vote and share it with your friends. There is not one single issue on which you would agree with Progress Now? You really are like Pavlov's dog hearing the bell. The rest of the letters won't do much harm. As to the numbers, kill them all and let the lord sort them out. Nutter, shouldn't you be busy planning Rehyer's election-night victory party? He's too busy planning Taller Coffman's victory party. Because she's going to be the next Governor of Colorado. Mark. His. Words.